Scion, the Toyota sub-brand, has been given a new lease on life. Founded in 2002 in a bid to reach young drivers, Scion quickly peaked at more than 170,000 units sold in 2006, but has declined to nearly one-quarter that number since. Blame old products and a profusion of excellent competitors for that decline. Things got so tough that by 2013 the automaker gave Toyota dealers permission not to sell Scions in their showrooms, the only place where you can buy one as they are not marketed independently. At least 200 Toyota dealers weren’t selling Scion anyway; adding to those numbers has simply allowed the company to align Scion availability with demand. 2016 Scion iA, courtesy of Mazda. That demand may soon see a spike going forward as beginning today two new Scion models are now on sale. The Scion iA is a subcompact sedan. The Scion iM is a compact 5-door hatchback. The two new models join a pair of sport coupes — the FR-S and the tC. A fifth model, the boxy Scion xB, is also available. 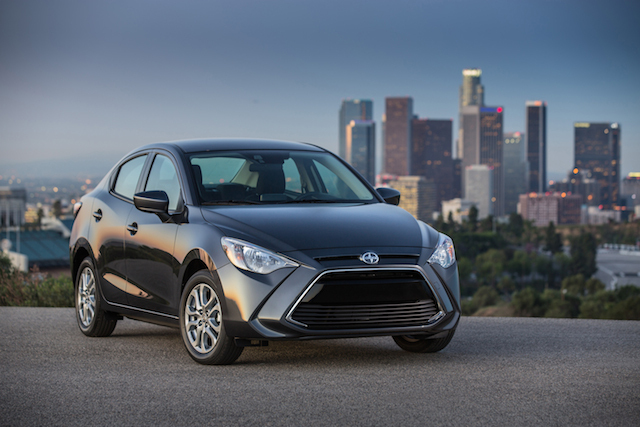 If the sleek silhouette of the Scion iA seems familiar to you, it is. Sold elsewhere as the Mazda2, this model is a visible representation of the recently crafted relationship between giant Toyota and diminutive Mazda. No, Toyota has not taken a stake in Mazda, rather the two are working together on projects that on the surface seem to benefit Toyota more than Mazda. Indeed, Toyota told reporters when the new models were introduced at the 2015 New York International Auto Show that the company would also have access to Mazda’s SKYACTIV technology, what has yielded a family of modern and efficient engines and transmissions. Seemingly, Mazda receives a much-needed cash infusion, what should help this automaker survive in an ultra competitive industry. Toyota, long a leader in small car manufacturing, thus leaves some of the work to others, especially where Scion is concerned. The Scion FR-S, by the way, is a Subaru-Toyota collaboration as Toyota holds a one-sixth stake in Fuji Heavy Industries, Subaru’s parent. The Scion iM also offers a look that should be entirely familiar to Corolla fans. Indeed, the iM is a rebadged Toyota Corolla, and perhaps the answer to customers who prefer something besides a sedan when shopping the Corolla. The iM’s relationship with Toyota’s global leading model should give shoppers confidence to commit to this product. The 2016 Scion iM, courtesy of the Toyota Corolla. The 2016 Scion iA is priced from $15,700 when paired with a 6-speed manual transmission and $16,800 when paired with a 6-speed automatic. A 1.5-liter, four-cylinder engine making 105 horsepower is standard. The top-of-the-range fuel economy is 33 mpg in the city and 42 mpg on the highway. Among the iA’s more notable standard features include keyless entry, power accessories, air conditioning, cruise control, a tilt and telescopic steering column, a 7-inch color audio display, Bluetooth connectivity, a low-speed pre-collision system, and a backup camera. Voice recognition, two USB ports, and 16-inch alloy wheels are standard. This model competes with the Ford Fiesta, Honda Fit, Nissan Versa Note, Volkswagen Golf, Chevrolet Sonic, Kia Rio, and the Hyundai Accent. 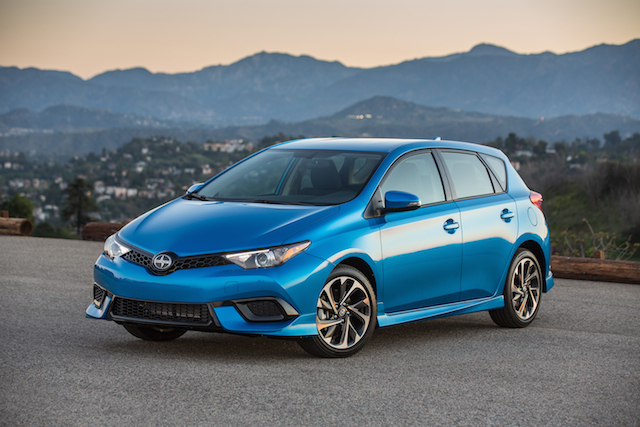 The 2016 Scion iM starts at $18,460 for the manual model and $19,255 for the CVT. It is powered by a 137-horsepower, 1.8-liter four-cylinder engine and is paired with a 6-speed manual or a continuously variable transmission. The CVT can be operated in manual mode, mimicking seven gear shifts (steps) as you shift your way up or down. The top fuel economy comes in at 28 mpg in the city and 37 mpg on the highway. Every iM comes equipped with 17-inch alloy wheels, LED daytime running lights, automatic headlamps, and power heated side mirrors. Keyless entry, air conditioning, power accessories, cruise control, a tilt and telescopic steering column, a 6-speaker Pioneer sound system, an auxiliary input jack, a USB port and Bluetooth connectivity are standard. The badges may say Scion, but the two new cars enjoy the Toyota treatment. That means when you buy one, your factory recommended service is covered for the first two years or 25,000 miles of service. Complimentary roadside assistance is provided for the first two years too. Furthermore, all Scion models are backed by a three-year, 36,000-mile limited warranty and a five-year, 60,000-mile powertrain warranty. A 60-month, unlimited mileage rust warranty also applies. Auto Trends will share additional information in the coming months once our comprehensive test drives have been completed.